It seems only fitting that the release of the new album hits the same week as our “hometown” race, the 2011 K-Swiss Ironman 70.3 Kansas. We’re looking forward to an action-packed weekend and we hope that you all are ready to race and to have some fun! 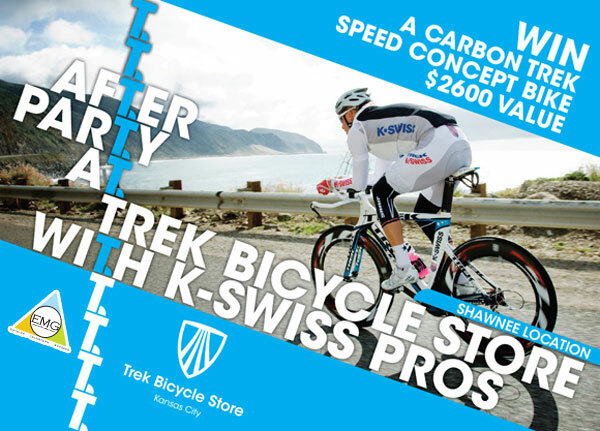 » Sunday (pm) – Trek / K-Swiss / EMG After Party – Trek Bike Shop, Shawnee, KS – Ironband set, Karaoke, and more! 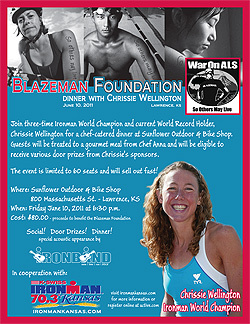 We kick it off with an acoustic set at the Blazeman Dinner with Chrissie Wellington on Friday night in Lawrence. At last report there were just a few tickets left so act fast if you’d like to take part in this wonderful event to benefit the Blazeman Foundation. On Sunday morning we head out to the course where we’ll once again spend the day rocking/singing/cheering for you when you need it most – on the run course! If you’re family is looking for the best spot to cheer you on during the run tell them to pack their tambourine and maracas come join us! Trek / K-Swiss After Party - Sunday Night! Finally, we’ll be playing a set at the Trek / K-Swiss / EMG after party at the Trek Shop in Shawnee – come on out and join us for food, drink, music, karaoke, and more! There is even a rumor that our AWOL guitarist, Mike, will be making a photo/autograph appearance at the event during his Kansas City layover on Sunday evening before jetting off to another round sold-out solo shows on the West Coast! Good luck to all the racers – we’ll see you out there!